The protein urine dipstick test measures the presence of proteins, such as albumin, in a urine sample. Albumin and protein can also be measured using a blood test. After you provide a urine sample, it is tested. The health care provider uses a dipstick made with a color-sensitive pad. The color change on the dipstick tells the provider the level of protein in your urine. If needed, your provider may ask you to collect your urine at home over 24 hours. Your provider will tell you how to do this. Follow instructions exactly so that the results are accurate. Different medicines can change the result of this test. Before the test, tell your provider which medicines you are taking. DO NOT stop taking any medicine before talking to your provider. The test only involves normal urination. There is no discomfort. 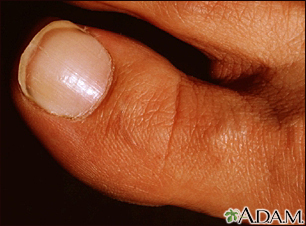 This test is most often done when your provider suspects you have kidney disease. It may be used as a screening test. 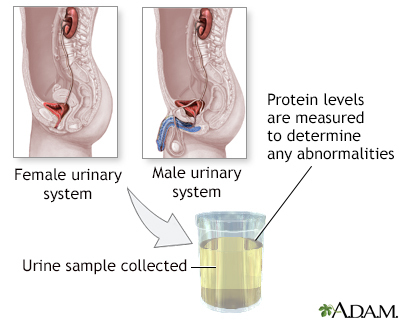 Although small amounts of protein are normally in urine, a routine dipstick test may not detect them. A urine microalbumin test can be performed to detect small amounts of albumin in the urine that may not be detected on dipstick testing. If the kidney is diseased, proteins may be detected on a dipstick test, even if blood protein levels are normal. For a random urine sample, normal values are 0 to 20 mg/dL. For a 24-hour urine collection, the normal value is less than 80 mg per 24 hours. Lamb EJ, Jones GRD. Kidney function tests. In: Rifai N, ed. Tietz Textbook of Clinical Chemistry and Molecular Diagnostics. 6th ed. St Louis, MO: Elsevier; 2018:chap 32. Urine is usually tested for protein when kidney disease is suspected.